The skywalks are meant for weather-resistent foot travel, but also provide a bevy of dining options. 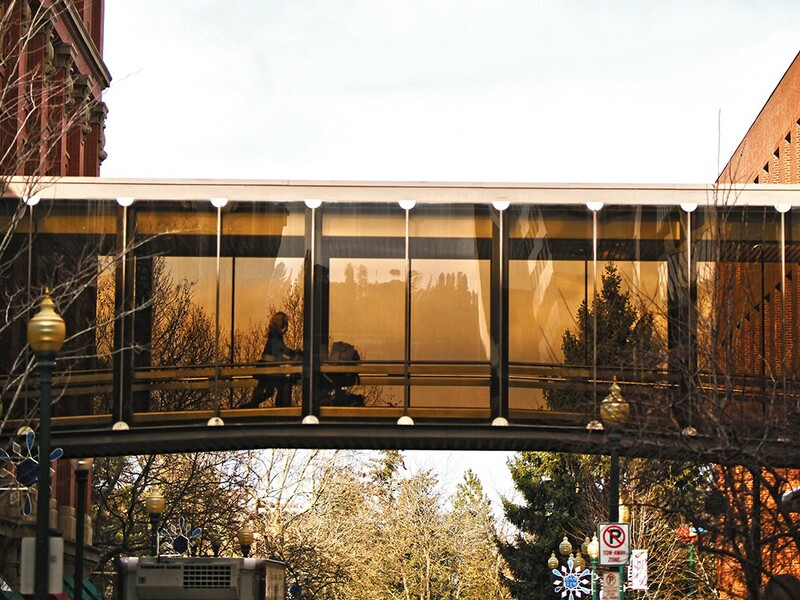 Spokane’s skyways seem to linger from another era, a time when a city’s downtown was so bustling someone decided to make an upper deck for transportation. So maybe it shouldn’t be surprising that its food also harkens back to a time of simpler cuisine. The most modern thing one might find in the coffee shops and lunch nooks are sandwich wraps. But in order to get a feel for the skyways, I had to cover a lot of ground. So I gave myself a mission: eat lunch every day for a week in the skyways. First on my list was a take-out joint called Our Daily Bread. Let’s get one thing one thing straight: this place is serious about Jesus. Up behind the restaurant’s condiment counter is a chart that looks like a periodic table, but instead breaks down different Christian denominations. Better yet are the scribbled notecards that hang up next to the only two tables, answering the prompt “God is.” (A couple of answers: “Daddy,” “Awesome,” “Coming Soon.”) The gentleman taking orders told me they were out of German sausage sandwiches, and directed me to the daily special: a meatball hoagie. Getting a special seemed like more of a skyway thing to do anyway, so I went for it. For $4.75 I wolfed down a sandwich whose meatballs felt as heavy as a collapsed star. And it came with chips and a soda, to boot. Definitely wins the skyway value award. Figuring I’d get my “dailies” out of the way, I stopped by the Daily Grind Downtown on Tuesday. It’s a cozy coffee/sandwich shop type of place that has the benefit of seats that extend out into the dim warmth of the Paulsen Center. On a green plate shaped like a flower, I ate a perfectly serviceable turkey sandwich on sourdough, and admonished myself after hearing every regular order a wrap. Oh well, next time. I sat inside the shop, looking out a window that faced the skyway I had used to get there. The reflections of construction workers and cars on the street bounced off the skyway’s tinted glass and mingled with the silhouettes passing through inside. The glass box I observed is part of one of the largest skywalk systems in the United States, according to city spokeswoman Marlene Feist. Feist tempers that, though, by acknowledging that there’s not a whole lot of skyway research out there. People don’t even agree which of Spokane’s skyways were the first. According to Feist, an article from the city’s 125th anniversary celebration says the first one came shortly after the Interstate arrived. But according to another city worker, the state’s architectural historian pegs the first skyway as the one between the Ridpath Hotel and the Ridpath Motor Inn, perhaps as early as 1963. The skyways of Spokane, Feist says, are generally owned privately, typically by one of the buildings to which it is attached. But both buildings have to have a contract in order for one to exist. In other words, you can’t just build a bridge over to your neighbor’s bank building and bust down their wall. Speaking of bank buildings, I made my third lunch stop at the Coffee Cup Café, located in the U.S. Bank building. It’s kind of eerie to sit and eat lunch next to a spread of five elevators, none of which saw much use while I was there. Here at the Coffee Cup, I took the special: a cheese-and-bacon sandwich with tomato basil soup. I bought a chocolate cookie, too. The sandwich was just a little dry and came to life the minute I began dunking it in the soup. It brought me back to the lunches I’d eat while watching movies during a sick day off in grade school. And you know what? That’s a memory worth occasionally dwelling on. On Thursday, I headed to the Metro Café, that big, open-spaced joint at the Sherwood Center. If you stand outside Columbia Bank downtown and look up and north, you’ll see the Metro Café. I know what you’re thinking: meatballs, turkey, bacon, pork. What’s a vegetarian to do? That’s why I spent my last meal going all-veggie. I hit up Reflections Kaffee Haus and Eatery at 618 W. Riverside, I chomped down a vegetable panini (Swiss cheese, cucumbers, red pepper, basil sauce) and pasta salad. While the pasta salad was nothing special, the sandwich did the trick. Being a little bit isolated, Reflections has the quiet feel of an empty cafeteria that made it a fine place to unwind. Until, of course, it was time to get back into the skyways and climb back toward the present.